A COUPLE WHO HAD BINKS OFF ME 6 YEARS AGO ARE NOW IN AN UNFORTUNATE POSITION WHERE THEY NEED TO REHOME HIM. BINKS IS A LOVING BOY WITH A GREAT TEMPERAMENT AND EASY TO LIVE WITH. BINKS HAS BEEN NEUTUERED SO COULD POSSIBLY FIT IN WITH MOST PACKS. IF YOU ARE INTETERESTED PLEASE CONTACT ME. HERE IS BINKS THE GREY AND WHITE BOY WITH HIS FRIEND YODA A RED BOY . Foxy has found her forever home photos to follow. Tachi is laying down by her new owner Nick, and her other new playmate Eski is standing up. Occasionally we have older dogs that need forever loving homes, due to know fault of their own. 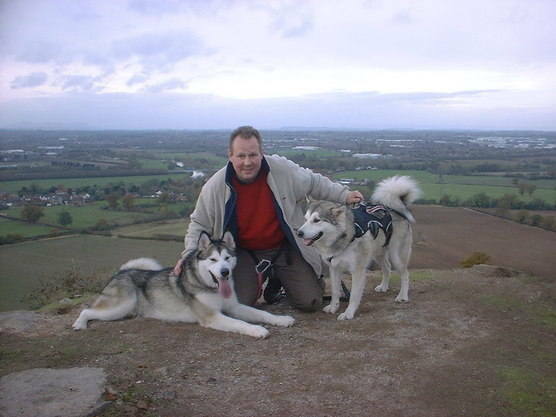 A great deal of effort goes into establishing who is suitable to own a Siberian Husky or an Alaskan Malamute. Assesing the enviroment the dog will be living in, what the dog is intended for, IE, companion, working or showing. Will it have sufficient exercise area in the garden to run in, and dozens of other factors need to be considered. When people are infromed we cannot let them have a pup, it's generally because we have their interest at heart, and one of these dogs are Just not suitable for them, or it maybe that their home is not geard to accommodate a dog. It's very important that when we place a dog with a family it's for the life cycle of the dog, and not that of vacation, as this isn't fare on the dog and all those concerned. Dogs are no different to people, we all need a stable living enviroment, and a family to turn to and feel loved by, and if a dog has to be re-homed this has a detrimental affect on the dogs well being so re-homing is the last resort for everyone. We at Polarpaws understand that people's circumstances change and although their situation for owning a dog at the begining may have been perfect, that may not be the case now and if the owners lifestyle has changed so much that it affects the well being of the dog, then finding a more suitable home should be considered. 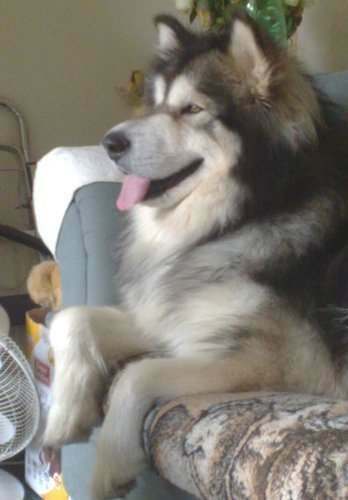 Polarapws asks all new owners to sign an agreement, stating if their circumstances change and the dog has to be re-homed as a last resort, then the dog should be giving back to Polarpaws (at no cost) so it can be assesd anad a suitable loving home found. Sometimes we can't always take the dog straight back due to circumstances, so we ask you to hold on to the dog till we find a suitable home. At Polarpaws we like to keep in contact with our extended family, and are only at the end of the phone should there be anything wrong with the dog, or you Just need a little advise. Although it is very rare that we have to rehome a dog, we do on ocassion find ourself looking for suitable candidates. If you think you may have a place in your heart for a re-homes dog and you think you could accommodate a new addition, then please give us a call and we can either keep you in mind should a dog become available or point you in the right direction of someone who may have a dog available.